Where should the Title/Artist/Album wording be displayed? 1. Where should the Title/Artist/Album wording be displayed - overlaid over Cover Art or below it? 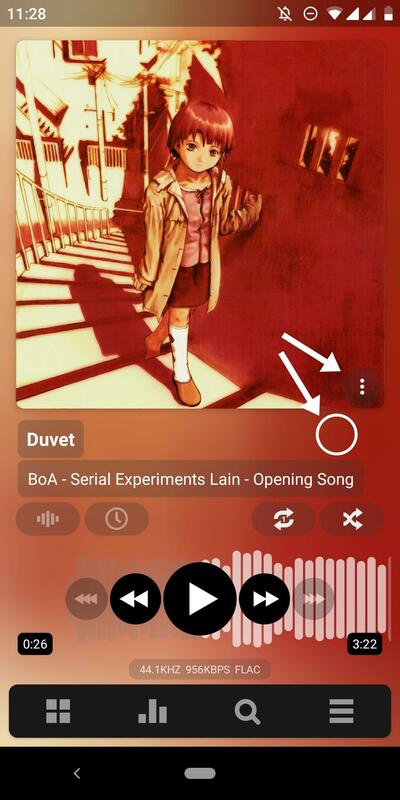 Is it possible for the artwork to have a overlay that displays the embedded lyrics when tapping on it? I agree about the options. I just wish we had them. I don't understand why anyone would want the metadata covering the album. If there was room in V2 to separate the two, I don't see why there can't be room now. In case anyone hasn't noticed, the ability to move the title/artist/etc text below the artwork is now included in the core app from build 810 onward, so you can now choose which version you prefer. I want the cover completely unobscured. No rounded corners, no buttons in the cover, no trimmed covers because they are too tall, nothing! This is absurd, I am not happy at all with the update, if anything I'm worse off now because the problem has now been 'solved'. Liking the new update, album art looks clean now. Ditto. Great to have an app developer that really listens. I am totally loving the new option for putting title, album name under the album art but if only the 3 dot menu button also moved in the same plane as the title and album leaving the album art clean would be just great. Or better still, just put the context menu icon at the bottom right, replacing the pretty-much useless three-lines icon which really only takes you to Settings (Settings could so easily be placed conveniently at the bottom of each context menu). That way the one-and-only menu icon would always be easily locatable in the same easily-clickable place whatever screen happens to be displayed, and as a plus it would also always be visible within Library views too (currently the three-dots icon scrolls off the top of the screen as soon as you page down in any library list). As you may know, I'm not a fan of a lot of the stupidity that Google introduced to Android with their Material Design fad, and pointlessly doubling up menus is one of the bits I dislike. @andrewilley the track context menu belongs to track (literally, it's inside track item, same for rating), thus it should be somewhere in that track area (on main screen it ends where vis, sleep, shuffle, repeat button start). Also, there are further plans for that bottom-right hamburger => it will contain user defined shortcuts to settings. Yeah the context menu should definitely be associated with the track, not the main navigation bar. Thank you, Max, for the useful information. So, put it beside the title, like most of it's options were before v3. Max, is there a reason you don't want to show the cover unadulterated by default OR user provided skins? Because you refuse to tell us but it's pretty obvious there's something going on, I just don't know what because it really makes no sense. Or maybe you don't care, IDK and I don't really care either because I got used to you being completely silent on this issue. I'm just old school, I hate all this multi-menu / context-menu / overflow-list rubbish that Google invented (what are they calling it this week?). One menu icon is fine for something the size of a phone screen, and less confusing for users than multiple icons bouncing around depending on what screen you are viewing. Frankly, I still feel it should be a physical button nicely located at the bottom of the device for my thumb to find. But that's just me. what are they calling it this week? I was gonna say Modern but that's actually Microsoft's old new name [sic] for what they called Metro. It's Material Design. One menu icon is fine for something the size of a phone screen, and less confusing for users than multiple icons bouncing around depending on what screen you are viewing. OK, you know what? Two of the three options in the hamburger menu are used by nobody and they are already inside the only other option on there. It should be a shortcut to the settings menu, and shown in another pane like the library, EQ and search buttons. Like this it's too broken an experience. Frankly, I still feel it should be a physical button nicely located at the bottom of the device for my thumb to find. But that's just me. It used to be so, but Google decided it was too confusing (and it was because I don't think most people used it) so they put it on the screen, to be hidden when useless. I'd accept replacing it with a cogwheel for Settings instead of a hamburger icon. But two different 'menus' always seems redundant to me in any app. I also dislike the way the three-dots menu icon scrolls upwards off the screen when scrolling through Library views, hence my suggestion to keep things simple and always have one single menu icon at the bottom of every screen, where it's convenient and easy to find. But that's not the way Max (or, to be fair, Google) wants to go. Has stumbled upon this update to 3.0, I have to say beautiful, modern, especially the animations. Few things are still not smooth enough GUI wise, the play/pause button doesn't look smooth as the rest and I also used to dislike the title display in bold black over the cover, the solution is now much nicer, though not perfect still. It says in the downloads it is the final, when will it be on Play Store? And also did Max consider adding an option for audiobooks to save the last play position? v3 is in the Play Store, but it is a staggered rollout, not sure if it's got to 100% yet. Saving the position of longer tracks was added in build 811. I just tested it, works perfectly! So happy this has been added, only small improvements in GUI and it would be perfect so far! (Again) my favourite music player, I imagine even that the sound quality was better. Btw, it was in discussion, that the v3 player could/would support Spotify, has this worked out by any chance?